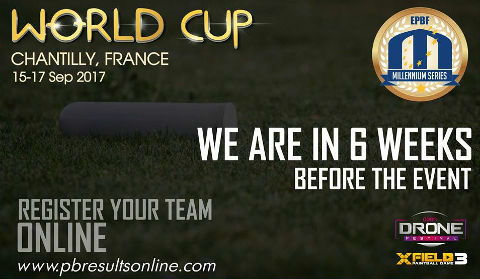 We expect the World Cup event to be sold out in the next few days with more than 160 teams! There are very few places remaining in the Divisions 2 and Division 3, so if your team hasn't yet entered you need to register quickly! If your team is registered, but not paid, we would urge you to arrange payment as soon as possible. Your place is not confirmed until full payment is received. Open Division 4 teams in particular need to pay attention to this! 3 weeks to go ... packing in process? 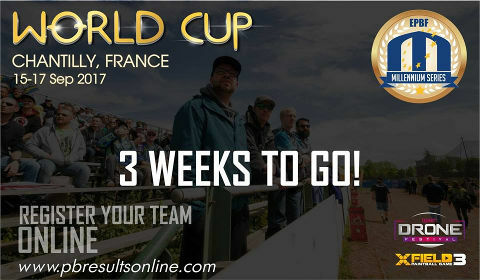 Still have a few spots available in open divisions, this is a perfect chance for you to participate in the Millennium Series World Cup in Chantilly! And one more tournament in Chantilly for our youths - the U16 Cup! 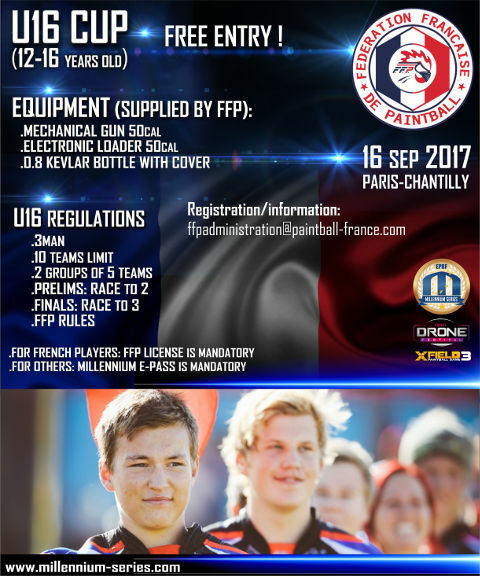 Organized on September 16th by French Paintball Federation. This 3-men cup will be held on separate field. There is an age limit - from 12 to 16 years old. 10 teams only! 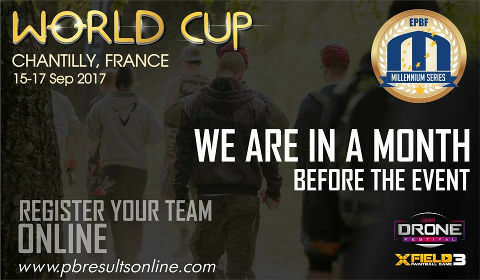 Hurry up to register at ffpadministration@paintball-france.com - there are just a few spots left! Just a month ... we will see you again shortly! Remember, you can register your team online at pbresultsonline.com! We still have spots avaible in open divisions 2, 3 and 4. Field layout for the Millennium Series Paintball World Cup is to be published on Thursday at 3pm (CET), 17th of August. We are getting closer to the event - 6 weeks from now. If you still think if you should go to Chantilly - yes! You should! Register your team online at www.pbresultsonline.com now! Never has the Millennium or any major paintball series had so many nations attending, a TRUE World Cup for the world of Paintball! 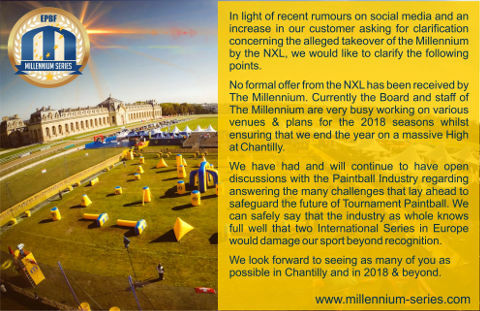 No formal offer from the NXL has been received by The Millennium. Currently the Board and staff of The Millennium are very busy working on various venues & plans for the 2018 seasons whilst ensuring that we end the year on a massive High at Chantilly. We have had and will continue to have open discussions with the Paintball Industry regarding answering the many challenges that lay ahead to safeguard the future of Tournament Paintball. We can safely say that the industry as whole knows full well that two International Series in Europe would damage our sport beyond recognition. We look forward to seeing as many of you as possible in Chantilly and in 2018 & beyond. Do not miss the event of the year! 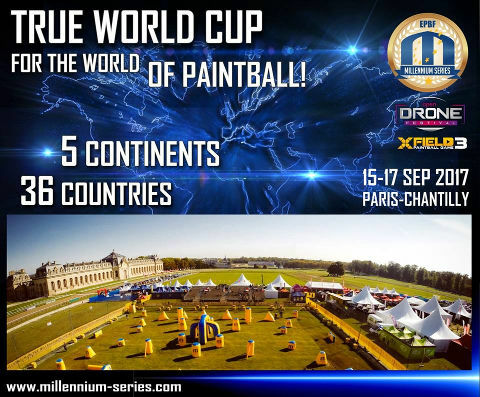 The Open Drone festival will be held during the Millennium Series World Cup in Chantilly! Register your spot now while it is still available! We expect all the open divisions to be full very soon! There are 3 divisions open for registration: Division 2, Division 3 and Division 4. Training booking for Paris-Chantilly is open now as well.